I have five mobile PCs at my disposal. At various times, I’ve taken all of them on the road with me. Earlier this week, I took at look at the various wireless profiles defined on each of those machines. I found no less than 18 entries on any given machine. My trusty Lenovo T520 — the machine I take with me most often, thanks to its 15.6″ display, comfortable keyboard, and capacious storage (3 drives for 2.75 TB) — had 25! Looking at what I found when running netsh wlan show profiles quickly led me to clean up old wireless profiles on all of those machines. PowerShell makes that pretty easy, so I’ll show what I found, then explain how I cleaned it up. Aside from numerous client office networks and my home WAPs, this list features lots of hotels and miscellany (25 entries!). 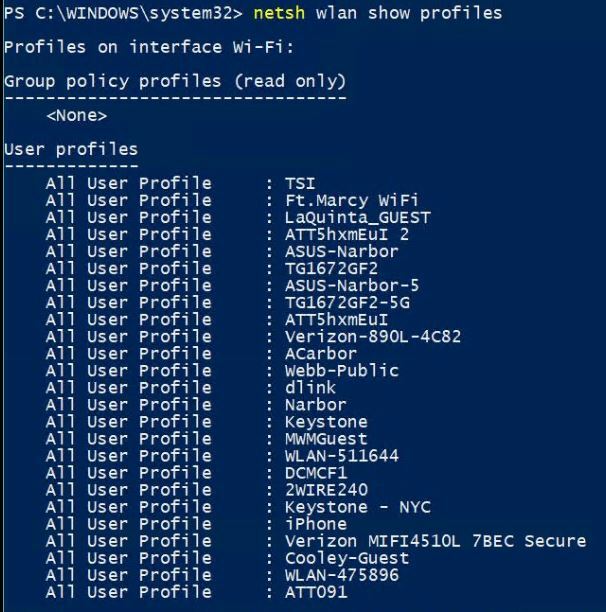 netsh wlan show profiles produced the list of profiles shown in the preceding screen capture. These include numerous client locations, my iPhone and home WAP networks, plus lots of hotels and other remote networks, many of whose generic names ring no bells with me at all. PowerShell lets you use cut-n-paste operations with commands, so I used the output from netsh wlan show profiles to capture the strings I used in the subsequent delete commands to clean up the entries I didn’t want or need any longer. Took me less than two minutes on any given PC to clean up my list. For those of us who take their PCs with them on the road, and who tie into lots of “away” wireless LANs, this kind of clean-up is worth doing at least once a year, if not more often than that. Good thing that PowerShell makes it fast and dead simple!